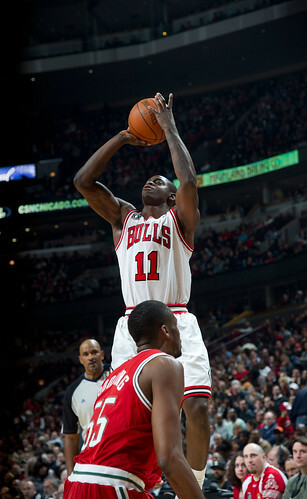 The Bulls Tuesday defeated the Milwaukee Bucks 90-77. That was good. The Bulls did so with still another relatively prosaic effort, mostly grind-it-out half court basketball with way too many jump shots and limited movement for most of the game that was bailed out by some very good defense. That was not so good. 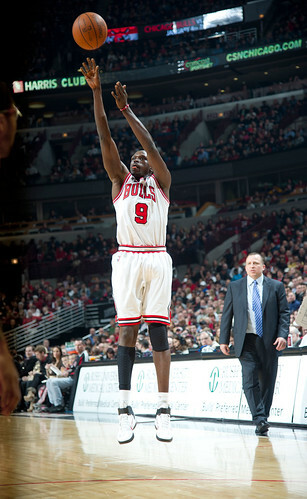 So the Bulls moved to 20-10, the third best record in the Eastern Conference with their 11th win in the last 13 games. That is very good. But once again they strained for ways to score and were fortunate Carlos Boozer and Luol Deng, who led with 24 points each, were making shots as the Bucks were another team that shrunk the court and dared the Bulls to make jump shots to beat them. That is not very good, because it’s difficult to win with any consistency that way. And though the schedule remains favorable with the NBA’s version of Sacramento State, Houston Baptist and North Carolina Central ahead with the Nets, Cavs and Raptors, this, nevertheless, looks to be a struggle for the Bulls for some time to come. It’s difficult to see how they won’t. There’s no crying in basketball, we know, and if anyone had reason to it was the 12-18 Bucks missing injured Brandon Jennings, Drew Gooden and Carlos Delfino and with Earl Boykins suspended for bumping a referee Monday. C’mon, really, the guy’s 5-3. Could anyone even have felt it? 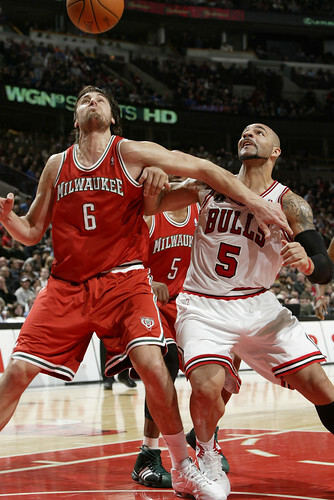 But Joakim Noah is more than the sum of his parts, meaning not just the 13 points and 11 rebounds. Noah gets the break going and goes with it. He dives to the basket and runs a real pick and roll. There is no pick and roll now. I know Boozer talks about it all the time, but there’s basically no roll. There’s a pick and pop. Boozer likes to back out and shoot, as does Kurt Thomas, who was terrific defending Andrew Bogut, who had four points on two of 12 shooting. Thomas, who left in the fourth quarter for eight more stitches after drawing a charging foul, worked hard in fronting Bogut, denying the entry passes and forcing Milwaukee to keep working the ball until they were forced into late shots, one reason they were a woeful 32.1 percent shooting. Though the pivotal defensive sequence against Bogut and which turned the game with the Bucks trailing just 71-68 with eight minutes left in the fourth and barely shooting 30 percent was after Thomas went out with the cut and Omer Asik returned. Asik ended with one point and four rebounds, but he had three blocks to go with five for Taj Gibson, and it was Asik on the floor and playing terrific defense in the Bulls clinching 17-6 run over the next six minutes. 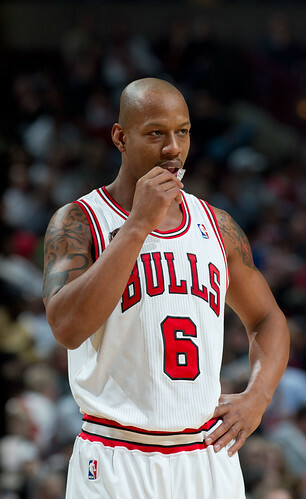 “Omer was very good, as was Taj,” said Bulls coach Tom Thibodeau. You don’t get much from Thibodeau on Asik as Thibodeau clearly is more comfortable with Thomas, who gives you more offense, anyway, and is the more stable contributor. But as Boozer, Rose and Kyle Korver were putting the game away with some efficient scoring and passing in that stretch, Asik was making one big time defensive play after another. It seemed the Bulls finally adjusted to the Bucks defensive schemes and began to rotate the ball more quickly to the weak side instead of just a strong side postup or pick and pop, and Korver, who hasn’t seen many of his baseline screen plays lately, finally hit a three. Though the Bucks played him well knowing Korver needs some space, usually off double screens or in transition, the latter which the Bulls haven’t been able to be in much lately. So the Bucks ran Korver off his shots early until the ball began to change sides later. As for Asik, he is an excellent help defender, and Keyon Dooling slid and fell for a turnover as Asik stepped out on a drive. Asik on the next possession blocked a Luc Mbah a Moute drive, and then Deng did a terrific job hustling back after a C.J. Watson miss and forcing a Corey Maggette turnover. Asik then grabbed a loose ball on a John Salmons miss and then forced Dooling to fade away badly and he shot an air ball. In that sequence on the offense, Boozer scored on a nice interior pass from Korver. Then Boozer hit a fadeaway over Bogut yet again, the Bucks going with the conventional wisdom that you muzzle Boozer by putting size on him. But Bogut was slow to come out and Boozer happily shot over him. Korver then got a hard screen from Boozer on an inbounds pass from Rose for a 15 footer, and when Rose swooshed a three on a Boozer pass with 3:41, the Bulls had pulled ahead 83-70 and there was little chance this Milwaukee team could score even 10 more points in fewer than four minutes. 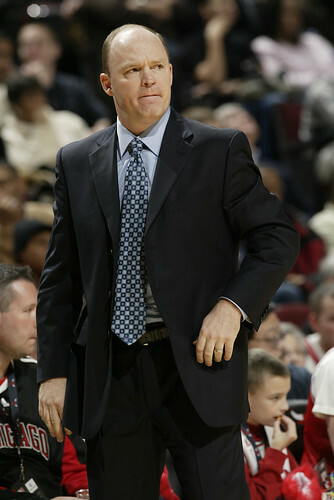 “Almost miraculously we were in this game,” observed Skiles. That’s because it’s not going to be easy for the Bulls unless they can get some transition points, which they haven’t for some time, and don’t seem likely to given their current makeup. The Bucks played to the plan the Bulls will see from most teams. That’s basically a triple team, which has led to those Rose turnovers of late, though he had just two Tuesday. 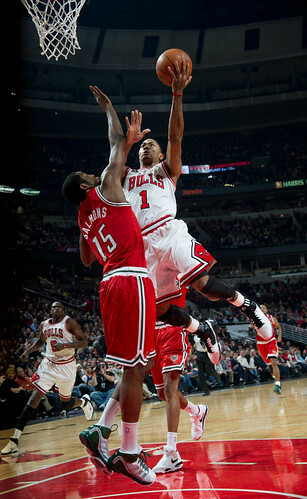 As Rose goes inside the defense is collapsing. You avoid the turnover by pulling the ball out, but Rose is told by the coaches to attack. One problem is both Thomas and Boozer prefer to drop back outside for jump shots, so the lane remains clogged. Noah would dive to the basket with a pass and he was an excellent passer from the post to the weak side to reverse the ball and open lanes for Rose. And Rose is doing his best to get everyone’s attention. 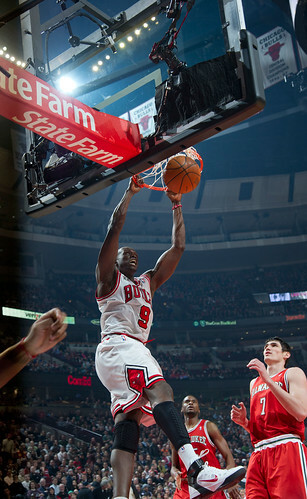 One of my favorite moments of the game was late with the Bulls about to pull away for good, leading 86-74 with 2:13 left. Rose drove right and Boozer was at the free throw line. 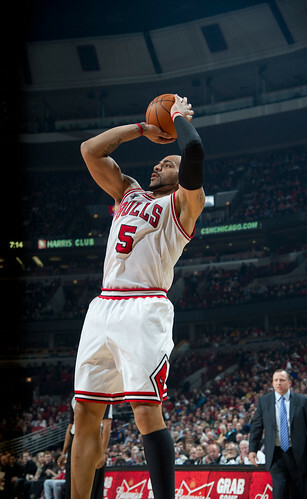 Boozer’s man went toward Rose and Boozer did go to the basket this time. 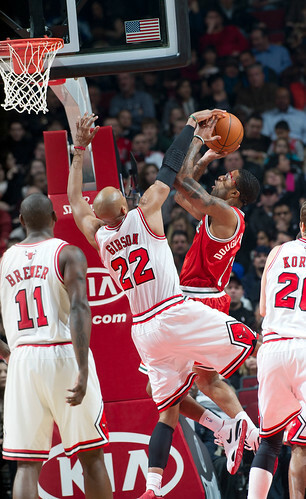 Rose bounced him a pass, but Boozer went up with a finger roll and was fouled. Though he’s not a great individual defender, I do give Boozer credit the way he communicates so well on defense, which has helped the overall defensive effort, and it also may be helping Rose get more vocal as well. Had the Bucks been able to make shots this would have been a lot different as the Bucks had a ridiculous 18-2 edge in second chance points (14-0 at halftime), outrebounded the Bulls, outscored them in the paint and held the Bulls to eight fast break points. Of course, the Bulls activity on defense had something to do with that poor shooting, and Deng broke out of his little scoring decline with more activity. The tip off for Deng to have a good game generally is his first quarter, and he got out quickly with a run out dunk as the Bulls opened a 9-0 lead to start and led 27-15 after one quarter as Deng had nine and Boozer eight. The Bucks had lost Monday night, were without three starters and Thomas was anticipating every move Bogut made. It looked like it might be a rout as Taj Gibson, whose production and minutes have declined of late with injuries and a concussion as well as the offense being dominated by Rose and Boozer, opened the second quarter with a terrific defensive sequence. First Asik blocked two Chris Douglas-Roberts shots and then Gibson blocked Douglas-Roberts and Bogut among his five. But Gibson was scoreless in 15 minutes. Douglas Roberts was so bad we’re taking his hyphen away. The Bulls still led 36-25 after C.J. Watson had a good sequence with a runner and a three-point play before Rose came back in , and then suddenly the Bulls were trailing 45-44 at halftime even though the Bucks were shooting 32 percent. Salmons, who led Milwaukee with 18 points but on five of 17 shooting, and Maggette attacked and got to the free throw line, making 11 of 15 in the quarter while the Bulls had 16 free throws all game. 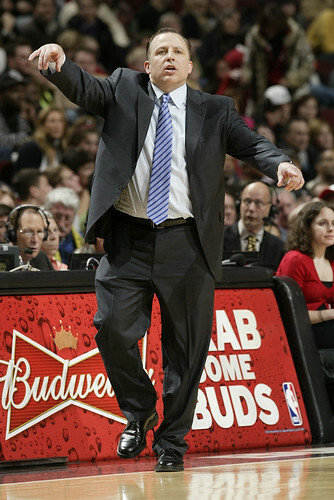 “I guess we have to drive the ball with more force,” said Thibodeau. I know there’s a lot of wailing about Rose’s lack of free throws, but you don’t get to the line shooting so many fallaway jump shots. 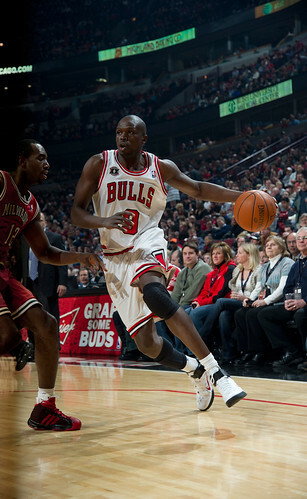 Deng carried the Bulls through the third quarter with 11 points, mostly on hard slice cuts beating Maggette to the rim, though the Bulls could not shake the Bucks and led 67-62 after three. They should have had a six point lead, but a Maggette three with his foot on the line was not overturned though it was obvious and repeatedly shown on the broadcast. 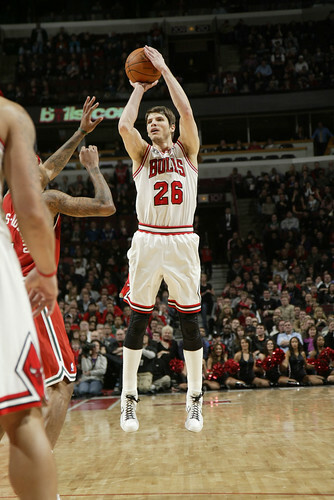 Nevertheless, it remained a moot point as the Bulls pulled away in the fourth and just kept winning. A very, very good thing.